Do computers have imaginations? Not exactly, but a recent post by software engineers on the Google Research Blog revealed the surprising (and beautiful) works of art that can come from pattern recognition. It starts with Google's image recognition software. After being fed millions of images, the software's “artificial neural networks"—intended to mimic the brain's own learning process—are able to learn enough to look at a picture, then recognize and classify specific features in it. (This technology is the key to reverse image searching.) Once the software recognizes something, it can amplify that feature within the image. If asked to do this many times over, the suggestion of a bird in the clouds quickly becomes a clear (and totally trippy) rendering as the feedback loop keeps, well, looping. This network knows animals the best, but the output of these learned features sometimes ends up being a mashup, creating modern-day mythological characters. The artificial network is comprised of “artificial neurons” called “layers.” The higher the layer, the more sophisticated the image interpretation will be. Lower layers create simple patterns, like the ones below. Even crazier, this technology works even with entirely abstract images. The images below show what happens when you ask the software to find and draw a banana, various animals, a measuring cup, a parachute and a screw, in a sea of dots. As you might expect, it isn’t a perfect science. Here’s what the artificial neural network drew when asked to find dumbbells. The image of a weightlifter (parts of one anyway) makes its way into the picture, which means that the software doesn’t know the difference between the object and the user. This makes some sense, as it’s likely that most of the images the computer was shown had an arm holding a dumbbell. Visualization exercises can thus help ensure that the software comes to understand the true essence of an object. Moving beyond clouds, the network can also completely transform images, though certain interpretations can be anticipated because of the built-in biases of a limited knowledge network. Horizon lines often become towers and pagodas, rocks and trees become buildings, and leaves transform into birds and insects. 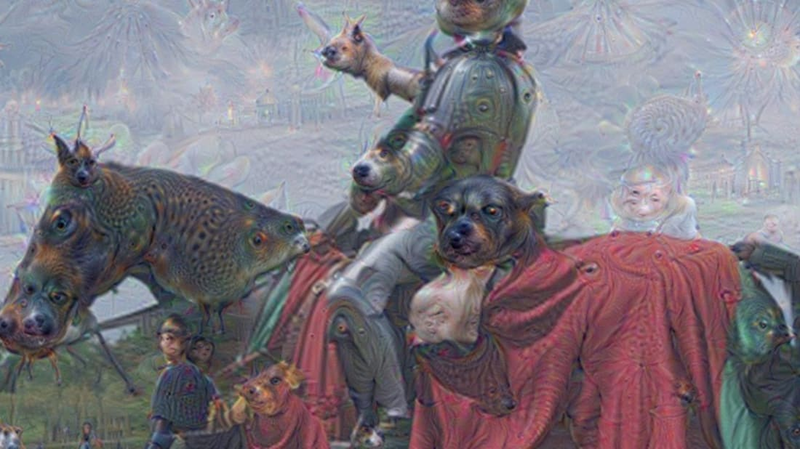 You can view Google's entire "Inceptionism” gallery to see more of what happens when artificial intelligence software over-interprets an image, much in the way that organically intelligent beings do. Besides giving insight into the way computers learn and process information, the surreal images produced feel like illustrations Salvador Dali would appreciate.